Anyone who has followed Jay McInerney’s long career has watched his gradual shift from a would-be F. Scott Fitzgerald to a kind of modern male Edith Wharton at home in the very circles of wealth and prestige his younger self so desperately yearned to break into. In the best of his early books, including his 1984 debut Bright Lights, Big City and Brightness Falls, published eight years later, McInerney’s characters were brash upstarts from the provinces intent on storming New York’s citadels of power that, in their minds, glowed at the heart of the metropolis like the green light at the end of Daisy Buchanan’s dock. These incursions inevitably failed, but the heady cocktail of youthful idealism and drug-fueled self-loathing that propelled their execution lent those early books an edgy, antic charm that sent copies flying off bookstore shelves. But that was all a very long time ago when McInerney was himself a brash upstart from the provinces. Since then, he has published several bestselling novels, been the subject of countless magazine profiles and gossip columns, and married four women, most recently Anne Hearst, sister of Patty, and heir to the Hearst publishing fortune. In his more recent novels, among them Bright, Precious Days, which comes out this week, McInerney’s characters, while born elsewhere, are long-time New Yorkers who attend lavish society dinners and rub shoulders with crude-minded finance types Edith Wharton would recognize at first sight. McInerney is clearly wise to this shift. 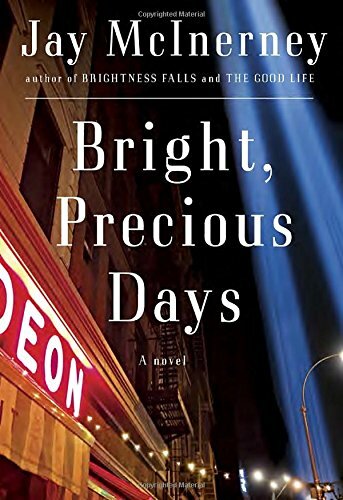 Bright, Precious Days, the third volume in a trilogy that began with Brightness Falls, brims with Wharton references, and it isn’t hard to imagine McInerney seeing Russell Calloway, one half of the couple at the center of the trilogy, as a 21st century Newland Archer, the bibliophilic gentleman lawyer of Wharton’s 1920 masterwork The Age of Innocence, who, as Russell might put it, values “the Art and Love team” over “the Money and Power team.” It’s a bit more of stretch, but it’s even possible to picture Russell’s wife Corrine as one of Wharton’s smart, headstrong heroines reimagined for a modern age when a Lily Bart or Ellen Olenska could be a happily emancipated woman married to the same man for 25 years. Unfortunately for his readers, the Wharton mantle is an uncomfortable fit for McInerney. Wharton was a native not only of New York, but of the uppermost echelons of its high society. Born Edith Jones, into the family for which the phrase “keeping up the Joneses” was coined, Wharton never suffered under the Fitzgeraldian illusion that the rich are different from the rest of humanity. When she describes Newland Archer in the opening pages of The Age of Innocence as “at heart a dilettante, [for whom] thinking over a pleasure to come often gave him a subtler satisfaction than its realization,” she is describing a rich man’s affliction, but also a distinctly human, painful one. Newland is a man bursting with love who, by some quirk of personality and upbringing, cannot show it openly to another living being. McInerney, on the other hand, despite his decades as a successful New Yorker and his marriage to an actual heiress, retains an outsider’s reflexive fascination with, and envy of, the city’s plutocratic set. Status envy fuels nearly every sentence of Bright, Precious Days, from its breathless recitations of high-end restaurant meals to the Calloways’ constant carping about the inadequacies of their 1,800-square-foot TriBeCa loft, with its single bathroom and uneven wooden floors. The Calloways, you see, rent but cannot afford to buy their TriBeCa loft or their Hamptons summer home, and when they indulge their pleasures, whether it be bonefishing in the Bahamas or guzzling first-growth Bordeaux at a Manhattan eatery, they can only do so at the invitation of their wealthier friends. That they are successful in their professions, Russell running his own publishing house, Corrine the CEO of a charitable nonprofit, and that their children, though occasionally sarcastic and whiny, seem reasonably happy and loving – all this means nothing. Well into middle age, Russell and Corrine remain at heart perpetual children with their noses pressed against the window pane, wondering what the rich kids are doing. That sound you hear in the background is the world’s smallest violin playing “New York, New York.” But the Calloways are deaf to the tune, and so Russell, displaying his lack of understanding of the mechanics of acquisition, overpays for a memoir of dubious provenance, and Corrine, wishing to escape the horrors of upper-middle-class poverty in TriBeCa, rekindles an old fling with a globe-trotting private equity baron with whom she has nothing in common beyond the fact that they are married to other people. There is plenty more to Bright, Precious Days, some of it interesting, great masses of it flabby and cuttable, but this is as close as the novel comes to a true narrative engine: As they enter their 50s, Russell and Corrine pretty much have it all – great jobs, lustworthy real estate, loving kids, lifelong friends – yet still feel cheated by life. Why can’t they own their TriBeCa loft? Why can’t they blow thousands of dollars on a bottle of wine at lunch? Why can’t they take their friends bonefishing in the Bahamas? Why, oh why, is the world so unfair? The Calloways seemingly had it all in Brightness Falls, too, but in that book, the pair’s thirst for still more made them compelling, even admirable, Corrine restlessly seeking meaning in life, Russell, wildly ambitious and impetuous to a fault, engineering a leveraged buyout of the publishing house where he worked as an editor. That he failed in spectacular fashion was less salient than the fact that he had the nerve to try, that at the height of the go-go 1980s, when Brightness Falls is set, he could imagine turning the machinery of commerce against itself to further the aims of art. By the mid-2000s, when Bright, Precious Days is set, that Russell Calloway is gone, his place taken by a cossetted, self-involved gourmand who revels in knowing which strings to pull to get reservations at the latest trendy restaurant and walks an extra three blocks on his way to work to buy his morning latte at the café that, in his view, makes “the best coffee in the city.” If anything, Corrine, always the more likable of the pair, has become an even greater cipher, risking a family and husband she loves for a pallid, cliché-ridden affair with a semi-retired financial titan possessing all the outward personality of a bonefish. Two years ago on this site I made the case for Bright Lights, Big City “as one of the great undiscovered gems of post-World War II American literature.” I stand wholeheartedly behind that judgment, and I would put Brightness Falls, along with Donna Tartt’s The Secret History and Tom Wolfe’s The Bonfire of the Vanities, on any list of indispensable novels about the 1980s. Whatever else you could say about the young Jay McInerney, he was a damn good novelist. But it seems long past time to admit that, like his fictional avatar Russell Calloway, that early Jay McInerney is long gone, his place taken by an aging society wit, whose work, while never less than polished and professional, has lost its precious brightness. The question is, how does McInerney expect his readers to feel about the characters? Are we supposed to sympathize with their no-TriBeCa-loft-ownership-for-you plight? Or are we supposed to see them as clueless middle-class people who don’t realize that not everyone (even good people with decent jobs and nice families) can be rich? Either way, I think characters like this would only be interesting to a rather restricted readership. In a way, the characters here remind me of Neal Gabler who recently wrote an article for The Atlantic about being unable to come up with $400 for an emergency, but his parents paid for his kids to go to college and he and his wife have a house in the Hamptons. Sympathy struggles with irritation and, frequently, irritation wins. Deb, you’re right that the audience for this book is narrow. I didn’t have space for it in the review, but there are long scenes at parties with fictionalized versions of various boldface names. Now and then I was able to pick up the references, but a lot of the time I had no idea who he was talking about and didn’t care. As I wrote in my earlier piece about McInerney, he once was very skilled at putting the reader in his character’s shoes (in one famous case, by calling his narrator “you”). He seems to have lost that skill. Maybe there are some Hamptons socialites who would find this book hilarious, but that seems a very limited market indeed.